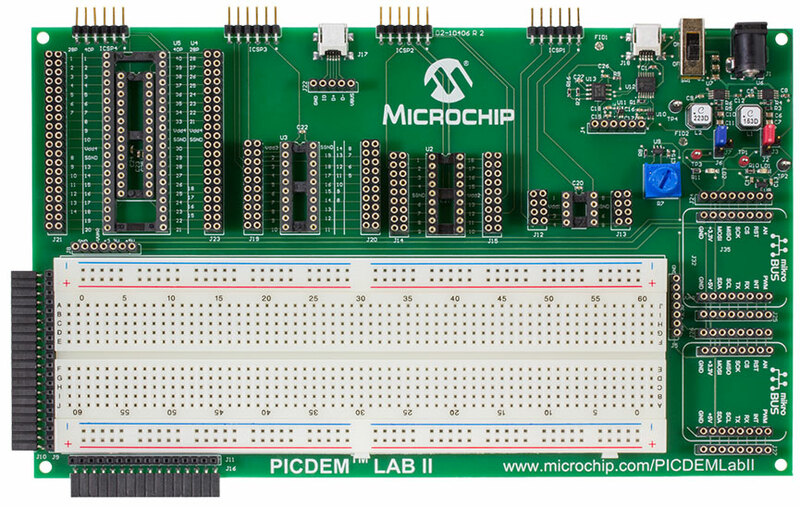 The PICDEM™ Lab II Development Board is a development and teaching platform for use with 8-bit PIC® microcontrollers (MCUs). At its center, a large prototyping breadboard enables users to easily experiment with different values and configurations of analog components for system optimization. Several external connectors allow for user-customizable expansion, while our library of labs and application notes enrich the development experience. The PICDEM Lab II Development Board is also fully compatible with our latest software development environment. The original PICDEM™ Lab Development Board has remained one of the most popular development tools for PIC® MCUs since its introduction. Microchip has taken this concept and expanded it for 21st century embedded development. The PICDEM Lab II Development Board supports any 8-bit PIC microcontroller (6-, 8-, 14-, 18-, 20-, 28- and 40-pin footprints), and provides an expansive array of connections for programming, I/O, analog and communications interfaces. The PICDEM Lab II Development Board is a valuable resource to engineers across a broad spectrum of specialties, from analog designers looking to explore the power and flexibility of MCU-based systems to engineering professors seeking a flexible and relevant teaching tool that they can add to their curricula. In keeping with the original, the PICDEM Lab II Development Board was designed to give you a simple development experience without the hassle and expense of building a custom PCB in the early stages of your project. You can design a system with one or several PIC MCUs since power and programming connections are replicated across all of the available sockets. Off-chip connections can be made in any manner, and the expansive breadboard provides a convenient area to add analog signal conditioning and drive components to a design. Three separate power supplies provide the capability to provide fixed or variable voltage to a system. With several industry-standard interfaces in addition to a system of configurable connectors, the off-board expansion possibilities are abundant. PICDEM Lab II is the perfect tool for sharing and acquiring new design ideas. To spur creativity, Microchip offers a series of labs, complete with bills of materials, user code and application notes. The hardware for the first four labs are included in the box, and others will be available soon. Join the Microchip forums, share your ideas and become part of the community! Power Distribution Connectors - Supply power to other parts of your design using one of the PICDEM Lab II Development Board's onboard power supplies. USB to I²C™ - Use the USB interface for diagnostic or control interfaces without worrying about the specifics of USB communication. USB to I2C conversion is handled automatically. MikroElectronika® Click Board™ Support - Two sockets give you access to nearly 100 inexpensive add-on boards, with capabilities ranging from GPS to alcohol-sensing.